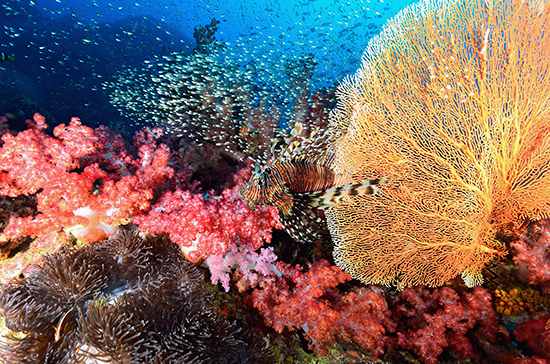 Beneath the turquoise waters and glittering waves of Southeast Asia’s oceans lies an otherworldly ecosystem teeming with kaleidoscopic fish and technicolour corals, making this tropical corner of the globe a magnet for scuba divers. But with over 65,000 miles of coastline and countless dive sites to choose from, it can be difficult to know where to start. So, whether you can tell your barnacle from your buoyancy control device – or not – check out our guide to the best diving spots in Southeast Asia. 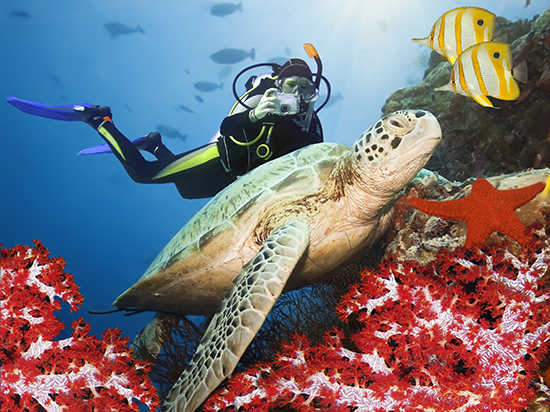 For the diving novice, the warm azure waters of Boracay are the perfect introduction to the mysterious undersea world. It may be just 5.5 miles long and less than a mile wide, but this teeny tiny island packs in 24 fish-rich dive sites along its reef-fringed shores. Its calm seas, plentiful marine life and 20-30 metre visibility are ideal for beginners, plus the gorgeous beaches make for a relaxing post-dive sundowner spot. To get dive qualified, you’ll need to complete an Open Water course, offered by the world-renowned Professional Association of Diving Instructors (PADI) and Scuba Schools International (SSI). Once completed, this four-day program allows you to dive depths of up to 18 metres when accompanied by a qualified dive buddy. 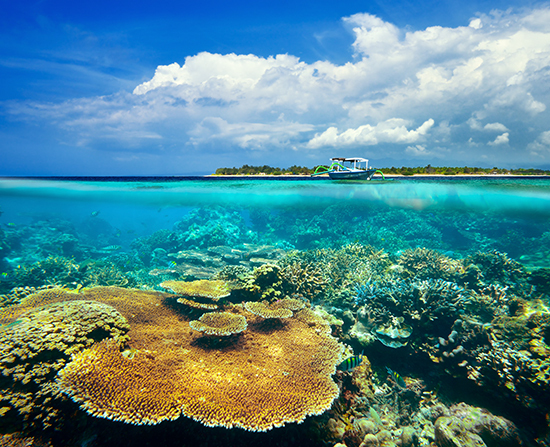 Indonesia’s idyllic Gili Islands, just off the coast of Lombok, are a great place to sign up. Here, fierce competition between European-run dive operators has driven down prices, and, in the self-proclaimed ‘Turtle Capital of the World’, you’re likely to share your practical classes with curious hawksbill and loggerhead turtles. On receiving your certificate, a whole world of underwater possibilities opens up – you can move on to Advanced Open Water and exciting specialties such as night diving and underwater photography. Between November and April, excited scuba enthusiasts hop onboard boats from Phuket and Khao Lak and sail to the chain of nine tiny islands that makes up the Similans. With undersea caves, narrow swim-throughs and reefs sloping down to depths of 40 metres or more, the sites around these islands are best suited to the more experienced diver, who will find lionfish, trevally, tuna, whitetip reef sharks and even whale sharks swimming among the 200 species of hard coral, seafans and sponges. With four major shipwrecks off its coast, the Island of Labuan is the perfect place for wreck diving connoisseurs to indulge their passion. 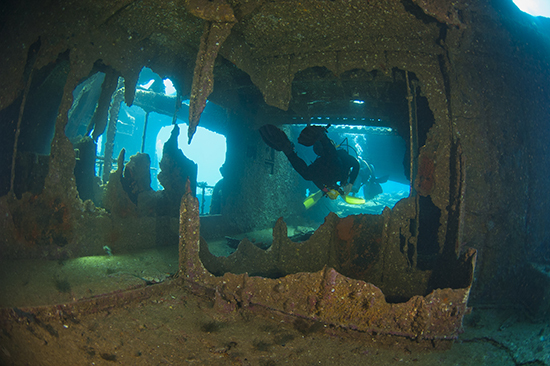 Two sunken World War II ships, a freighter and a fishing trawler lurk beneath the waves, starting at a depth of just eight metres, so even those inexperienced in wreck diving can have a go. More proficient divers can swim through the hulls or even take a specialist wreck diving course. An extinct volcano beneath the waves, Sipadan is so special it’s a protected site, with only 120 divers per day permitted among its corals. Over 3,000 species call this reef home, and it’s overflowing with turtles, whitetip reef sharks and vast schools of fish. One of the world’s best diving walls is found here: 600 metres of colourful coral where hammerhead sharks are sometimes spotted. The icing on the cake is the eerie Turtle Tomb, a maze of underwater tunnels leading to a cave filled with the skeletons of turtles that had been unable to find their way out. This one’s for qualified divers only. 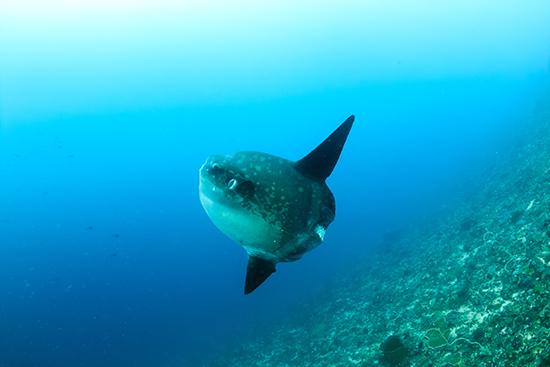 Bali is a great place to spot mola mola, an elusive creature otherwise known as the ocean sunfish (pictured above). These gentle giants reach up to 4.2 metres in length and can weigh up to a whopping 1,000kg. Dive the crystal clear waters of Nusa Penida, just to the east of Kuta, between August and October for your best chances of spotting one.